For the stage that first appeared in Super Smash Bros. Brawl, see Figure-8 Circuit. Mario Circuit as it appears in Smash. Mario Circuit (マリオサーキット, Mario Circuit) is a stage based on the course of the same name from Mario Kart 8 in Super Smash Bros. for Wii U and Super Smash Bros. Ultimate. The stage takes place on a set of platforms that move around the track, and will stop at certain parts of the track, similar to Mute City, Port Town Aero Dive, and the 3DS-exclusive Mario Kart stage Rainbow Road. Shy Guys drive around the track, which is a reoccurring theme in the Mario Kart stages. 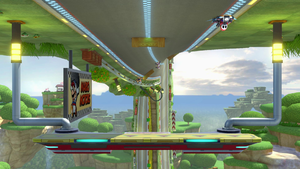 Because of the track's antigravity effect, the road will sometimes be above or to the side of the fighters. Unlike in Mario Galaxy, fighters are not affected by the unusual gravity. The track is able to meteor smash anyone under it while moving. A circular tower across from the castle. Not connected to the track. A platform next to the bridge, with the track as the right side wall. A gap in the railing, with the track in the background below. Stacks of tires on the track act as a third platform under the gap, but if racers appear they will travel across this platform. The underside of a long platform, with the track as the ceiling. Racers can hit a jump that sends them close to the platform. Some platforms next to the other side of the bridge, with the track as the left side wall. A small island floating in the middle of nowhere. Not connected to the track. A section of railing and brick wall, with the track in the background above. The finish line, with the track and sidelines as the ground. The "Mario Kart" sign above is a long platform that avoids the racers. In Super Smash Bros. for Wii U, the Ω form uses the same base platform as the regular form, but it can not be passed through from below. The platform also doesn't stop at any locations, and the track doesn't interact with the stage. In Super Smash Bros. Ultimate, the Ω form and Battlefield form are similar to the Ω form in SSB4; however, the main platform is resized and reshaped to match Final Destination. The three soft platforms of the Battlefield form are metallic and are unique to this form. Ω form in Super Smash Bros Ultimate. Mario Circuit as it appeared in Mario Kart 8 and Mario Kart 8 Deluxe. Mario Circuit is the name of a track that appears in every Mario Kart game since Super Mario Kart. 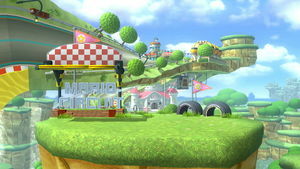 This stage is an accurate recreation of Mario Circuit in Mario Kart 8 and Mario Kart 8 Deluxe, which is a prime example of the twisting, F-Zero-esque course layouts made possible by the game's new anti-gravity mechanic. Mario Kart DS is the first game that allowed Shy Guys as playable characters, but only through DS Download Play. If friends wanted to play the game together, but somebody didn't have the game, they could still connect together through DS Download Play. It wasn't until Mario Kart 7 that Shy Guys were playable through normal means. In this stage, the karts are driven by Shy Guys, and the karts they drive on are the Standard Karts from that game. The movement of this stage causes stage hazards due to parts of the road dealing damage to fighters. Some of the landing positions also have strange layouts that make competitive fighting difficult; as such, this stage is usually banned in competitive play. One of the stops the stage will stop at. Another stop, taking place on a nearby cliff. A stop at the edge of the track with the Shy Guys driving on the track. Another stop at the starting line. Mario, Bowser and Yoshi are ready to fight. A Shy Guy is about to ram into a frozen Corrin. The Mii Fighters shielding on the stage in Ultimate. If a fighter is caught by a Boss Galaga or Beetle before the stage scrolls to the section where the road is above the fighters, but breaks free as the stage scrolls to that point, they may get stuck "inside" the road and constantly be knocked back and forth, taking damage until they are blasted outside of the road. Karts driven by Toads were planned to appear, probably similar to the Shy Guys' role in the same stage. Though normally impossible to land on, jumping on top of the bridge while the stage is landing on the first bridge stop will KO the player. Rarely, if the stage is played for 15 minutes or longer, it may restart twice, the first time being the correct looping process and the second time being as if the stage was restarted in Training Mode. If the stage is restarted in Training Mode, all but one of the Shy Guys will disappear - the visible Shy Guy is the only one with a hitbox. This page was last edited on April 17, 2019, at 02:37.